Weems & Plath are a US firm with a long record of manufacturing quality barometers and other instruments and products for marine users. 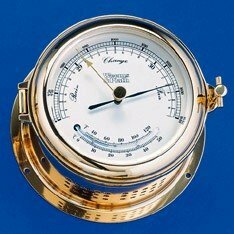 Their large range includes many aneroid barometers, many designed for use on boats and in ports. Here is a small selection from the middle and upper part of their range. If you don't see something you like here, you can view their full range at the Weems & Plath website. They are not retailers, but a large number of on and offline stores carry their product, among them and Amazon. The Weems & Plath aneroid barometer from the Cutter Collection is an example of a medium capability barometer, ideally suited to most home situations, provided your home is located below an elevation of 3500 feet, or 1065 meters. It is fully adjustable to a sea level equivalent pressure up to that altitude, but is not temperature compensated. The movement is concealed behind the dial. The case is made of polished forged brass and resembles a porthole in a boat, with a hinged bezel case. Overall the base diameter is 4.625 inches (11.75cm), and the case is 1.375" or 3.5 cm thick. The barometer weighs a pleasing 1 lb 10 oz or almost 740 grams. The recommended price is US$216.00, but last time I looked Boater's World was selling it for $149.99. A matching clock is also available. The Martinique range from Weems & Plath is much larger, with three barometers and numerous clocks. These brass cased instruments can be wall or stand alone mounted, and paired with a clock in a single mount or as bookends. The standard Barometer (190700) is designed for accuracy, with temperature compensation and a slightly larger dial (4" or 10cm) than the Cutter barometer. At slightly greater cost, it can be calibrated for elevations from 3500 to 7000 feet (1067-2133m), with the standard model designed for elevations from sea level to 3500'. The design is a bit more conservative than the Cutter barometer, but still includes a hinged bezel case of solid forged brass with a lacquer finish. As with almost all Weems & Plath instruments, there is a limited lifetime warranty on the movement - so while it is in your ownership and you retain the receipt you are covered. The large dial is served by a needle which will show pressures over a 4 inch range from 27.5 to 31.5 inches of mercury, and also shows pressures in millibars. A pointer allows comparisons of pressure movements over time. Overall the case is 5½ inches in diameter and is 2¾ inches thick. That's quite a lot of brass, and the whole instrument weighs 3 lb 3 oz. (14 x 7 cm, almost 1.5 kg). So dropping it on your toe would do more than void the warranty. In comparison to the Cutter barometer, the Martinique offers greater accuracy through temperature compensation, and is suitable for higher elevations. None of the other differences affect its usefulness and suitability as a weather instrument. Its recommended retail price is US$310.00, but is about $75.00 less at Boater's World. The Martinique range includes two other barometers. Although its price is only marginally higher, the standard model is more suitable for most needs. For more information on barometers, visit the pages on Buying a Barometer, the Aneroid Barometer, and Setting A Barometer. You'll find links there to other pages there which may interest you. And finally, here is a page on How To Read A Barometer. It's not as easy as you might think to use a home barometer for weather forecasting. eBay is a good place to see lots of barometers in one place - new, used and antique. Even if you aren't in a buying mood, and list below shows you what's on sale at this very minute, eBay can be a great way to learn about specific items and barometers in general.